Majority of the time Sizewell Hall is fully booked. Occasionally, there are some weekends and mid week slots that are available. Below is a list of the current vacancies. For other midweek availability please contact us, by email office@sizewellhall.org.uk or ringing us on 01728 830715. 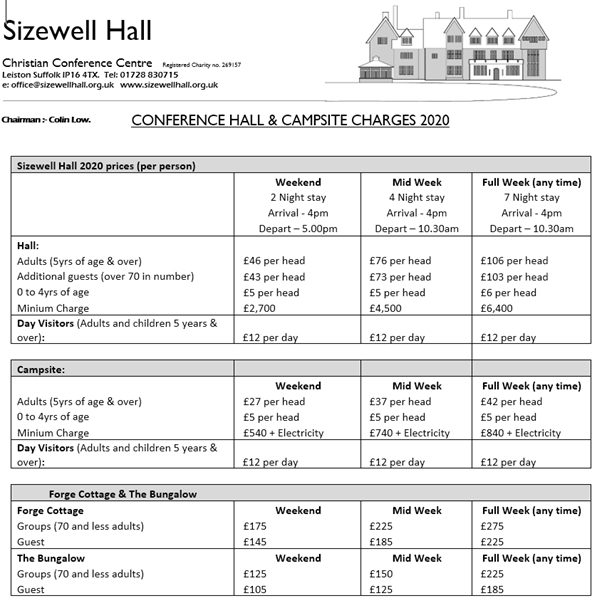 Please remember Sizewell Hall is a self catering centre our prices reflect this. Those coming to share meals and use the facilities will be charged at the price of £12 per day. This does not apply to friends who drop in for an hour or so. Please contact the office on 01728 830715 or email office@sizewellhall.org.uk to discuss any of the above. Sizewell Hall is a self-catering centre and our prices reflect that.